In TCM, ﬂu is perceived as an invasion of the body by external pathogenic factors (邪气), brought about by seasonal changes. The battle between pathogenic factors and the body’s immunity, also known as Vital Qi (正气) results in the exhibition of symptoms such as runny nose, cough, dry throat and fever. The six external pathogenic factors are the wind, cold, summer heat, damp, dryness and fire heat. They arise from abnormal changes in the weather or climate, and can occur in combinations. The two most common ones are the wind-cold flu (风寒感冒) and the wind-heat flu (风热感冒). Occurs more frequently during cold weathers or environments. Running nose with clear mucus, severe aversion to cold, chills, fever, little or no sweating, cough with clear phlegm etc. Treatment methods such as herbal remedy, acupuncture or cupping are usually employed to ease the wind-cold symptoms. Herbs used will usually be warm in nature, such as Folium Perillae (Zi Su Ye, 紫苏叶) and Ramulus Cinnamomi (Gui Zhi, 桂枝), which aim to induce sweating to dispel the cold and wind pathogenic factors from the body. Hot sensations, cough with yellow phlegm, running nose with yellow mucus, sweating, headache, sore throat, thirsty, yellow urine, dry and hard stools etc. Treatments are aimed at expelling out the heat and cooling the body. Examples of herbs which are used include Fructus Forsythiae (Iian qiao, 连翘) and Flos Lonicera (honeysuckle flower, 金银花). 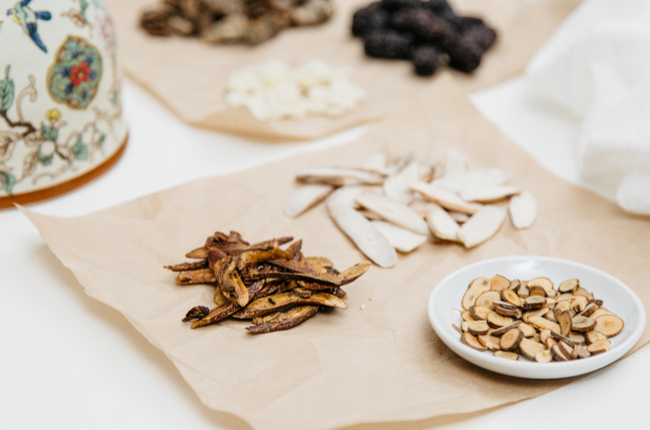 Note: As discussed above, treatments vary a lot when dealing with different types of flu patterns in TCM, so it is important to have a correct diagnosis of your own condition before proceeding with any remedies. Preparation: Slice the ginger and simmer in boiling water with the lid closed for 5 to 10 minutes. Add in brown sugar after. Drink while it is hot. Preparation: Simmer the flowers and leaves in hot water for 5 to 10 minutes. Add in the wolfberry fruits. Drink when cooled. As the saying goes, prevention is better than cure. With a strong immunity, one will be less susceptible to falling sick. It is vital to strengthen one's body immune system, especially during the season of haze or influenza. Here are some tips! Always stay hydrated. A minimum of 8 cups or 1.9 litres of water daily is recommended. Exercise regularly. Simple jogging or swimming 3 to 4 times a week can help to ensure good blood circulation and a smooth flow of Qi in your body. Have adequate sleep. Have at least 7 hours of uninterrupted sleep every night to recharge your body. Have a balanced diet. Avoid spicy, fried and oily foods to prevent one from getting heaty. Avoid cold drinks. According to TCM, cold drinks and food can hurt our digestive system. Ensure adequate intake of foods high in ﬁbre and constantly replenish fluids to ensure smooth bowel movements. Herbs like wild American ginseng and cordyceps are known to help boost the body's vital Qi and improve the respiratory (lung) functions. Having a luohan fruit tea regularly can also help to clear the lung heat and replenish the body's yin. Source: Prime Magazine Dec - Jan 2017 Issue. Reproduced with permission.